I usually buy a game at Christmas. This time I’ve bought Dropmix. I saw it on sale at a very attractive price and could'n’t resist it. For the amount you pay you get a lot. There is a handsome plastic console where you pay the game and a set of 70 cards, each of which contains an RFID tag that is read when you play the game and used to trigger the playback of a sample from a music track. The game runs as an app on your phone or tablet which talks to the console over Bluetooth. You play the game by laying cards down to build up a song. The cards have a characteristic colour and volume level. Coloured cards must be played on the matching colour of the deck and have a louder or equal volume setting than the card they are being placed on top of. Get stuck and you can press a big button which selects a bunch of cards to be removed. There is a very wide range of music on offer, including Ed Sheeran among others. You can buy themed packs of 15 to get more sounds but they are rather expensive. The cards are nicely made and have artwork that makes them nice things to have before you even play the game. There are also black and white cards that are played to modify the sound. I was very impressed by how well the samples knit together to make interesting sounds. There are a variety of play modes, including a single player mode, or you can just put cards down to see what you can make. You can even save arrangements that you’re particularly pleased with. The game is from Harmonix, the people that made a bunch of guitar games. They really know how to make the music fit together, and the gameplay turns out to be a lot of fun. Well worth a look. A while back I was moaning about the way that there seem to be robots out there which are looking for search terms on sites and then emailing the owners asking to place paid content or link to them. Then I got an email last week from Kendra telling me about Game Cows, a board game site. I’ve posted about the odd board game here and there, and she seems to have picked up on that. 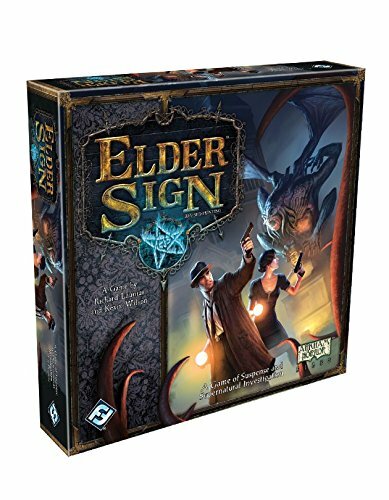 The site has some useful reviews and whatnot, and if you’re into board games you should find it interesting. 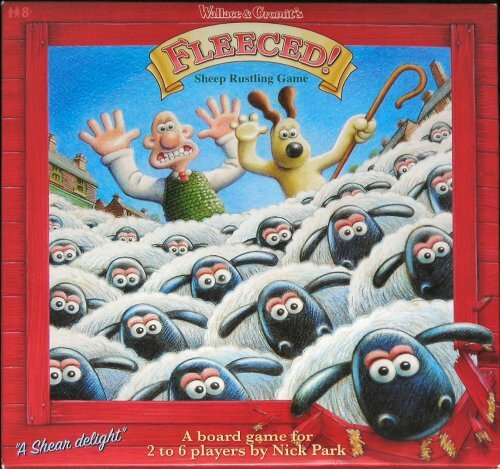 A while ago I write a review of the Wallace and Gromit Fleeced game. In it I mentioned that some people were complaining that the game could go on forever with no winners because everyone just spent all their time rustling sheep from each rather than trying to win. Well, that’s what we did last night. For four and a half hours. Great fun though, and we did get a winner in the end…. 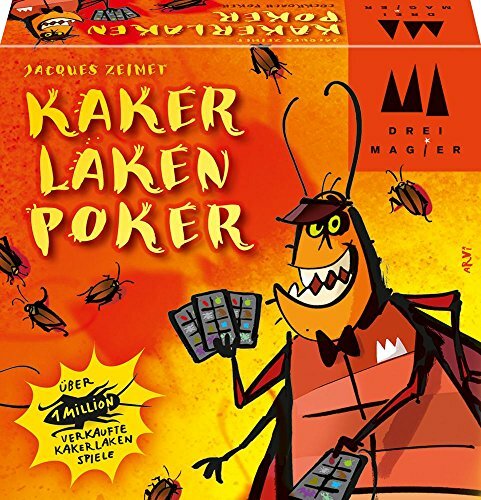 We were playing Cockroach Poker today. I’ve not laughed so long, or so loud for quite a while. It’s a game of bluff and counter bluff involving stink bugs, cockroaches, rats, spiders, scorpions, bats and flies. Very muchly fun. Get a copy and start passing those bugs around. We had a go this evening. I thought it was a game where you try to balance objects on a plinth. It is, but there's a lot more to it than that. The idea of "balance" goes a lot further than than stopping things from falling over. Some of the objects that you balance are beautiful, stylised models of creatures from land, sea or air. And you have to keep their worlds in balance by adding other things too. So the game turns into a ecological balancing act as well as a physical one. And it gets even more interesting when you add in the "modifier" pieces. There are two types of these. One of them lets you "cross" one creature with another, to make a new species. The other lets you "migrate" a species into another realm. Perhaps we could have used one to get that pesky octopus out of the water. There are a couple of "miracle" pieces too, I'm looking forward to seeing what they do. The game is played in conjunction with an app that runs on your Android or Apple device which keeps score and shows the effect your actions are having on the ecosystem you are creating as you play. Lots of players can cooperate, but there's not really a competitive mode (although it is kind of fun to put your piece on the plinth in a way that makes it horribly difficult for the next person to do anything). Everyone who started playing (including me) began by regarding the game as "Computer Jenga with an ipad scoreboard". It's not. There's a ton of depth to the gameplay. It's not about getting everything on the plinth, it's about getting the right combination of objects on there, and adding bits to find out what they do. It's a bit pricey, but not that much more than a video game. And I've seen board games with far fewer, and less engaging, pieces, on sale for a lot more money. The game has a lot of polish, from the beautifully made models to the well drawn user interface of the game. Strongly recommended. We spent some time last night playing Fibbage. I first played it earlier in the year at David's. It's so good I actually bought a copy. It's a great party game. You need a PC, preferably with a big screen, and each player needs a device with web access. Then the game invites players to invent answers to silly questions and search for the correct one. We didn't playtest this at all is daft. It's the kind of game you can win by being the shortest player. Or lose by being eaten by a dragon. Or not touching your nose the right number of times. The games are short, furious and fun. I can't imagine spending an entire evening playing this game, but for a bunch of mad fun before you start playing Coup I reckon it would be hard to beat. Spent a very happy evening playing board games tonight. We started off with a session of Coup, always good for a giggle. Unless you assassinate one of your son's characters, and he then promptly turns round and knocks you out of the game. Oh well. New tactic. Don't attack the player on your immediate left, as it's their turn next and they will instantly go for payback. Then we got out the Battlestar Galactica game that I really wanted to play. I bought it ages ago, but never played it properly. Fortunately number one son had, and so we all had great fun finding out how the game works and then finding out how to work each other over during gameplay. The premise is quite simple. The crew of a spaceship is trying to guide it and a bunch of civilian ships to safety in the face of implacable (and rather numerous cylon foes). The twist is that some of the crew are working for the enemy, and at the start nobody knows who the cylons are. At every turn the crew must deal with a crisis, and work out from the outcomes who can be trusted and who needs to be put into an airlock for a one way trip into space. By a combination of skill and miss-reading the rules the good guys managed to make it to safety, which made me a rather hapless member of the winning team. It's a great game, although there is a lot to take in at the start. The events in the game pay good service to the plot of the TV series (that is, the second iteration) but you don't need to have seen the programme to be able to enjoy the board game. Next time we play, I hope I'm a cylon though, it looks like fun. This is a neat little game which gave us a diverting few minutes this lunchtime. 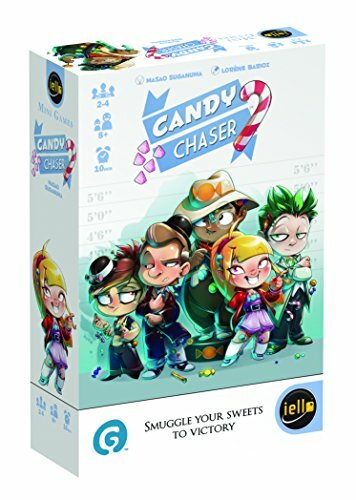 Each player is trading in a particular type of sweet and players take it in turns to move the price of any the sweets up or down. Once trading is over you have round where everyone tries to figure out who is selling which kind of sweet. If someone works out which sweet you are trading, you are out. If they get it wrong, they're out. Last player standing with the highest score wins. Games last around 20 minutes or so maximum. It's quite fun to play, although in typical Computer Science fashion we all massively overthought the situation and I managed to win one by just doing the simple, stupid thing. I didn't take this picture at the cafe. But I'm still very pleased with it. A while back we went to the board game cafe in London. We had a great time there and so today we went out to the one in Bristol. Just as much fun. In fact it was even better because we had more time to play, with no train to catch this time. We had a proper go at the Thunderbirds board game. And by proper I mean that we played it long enough to lose. Oh well. As with the one in London, the service and knowledge of games was first rate and the food was excellent. We've been meaning to go to Draughts for a while. the first Board Game Cafe in London. In case you're not sure what a "board game cafe" is. It's a cafe. With board games. And it's awesome. I've always fancied having a go at the Thunderbirds board game, and they had a copy there. The box says the game takes around 40 minutes to play. That might be true. But it also took us around 40 minutes just to set the game up. Each player takes on the role of a character from the show and pilots Thunderbird craft around the globe performing rescues and defeating the Hood's evil schemes. Or in our case losing. In around 40 minutes. The loyalty to the show is pretty slavish. The nicely printed cards are all dotted with stills from the episodes. There are FAB cards you can play, pods you can load with equipment and even the automatic camera detector gets a look in. And yet, I'm not completely sure it's fun just yet. I think a lot of the problem was lack of familiarity, and numbers - there were only two of us playing - but I'd love to have another go. As for the venue, as we left around Sunday lunchtime it was filling up nicely. If I lived in London I don't think I'd want to go anywhere else on Sunday morning. Hull has a boardroom cafe too, the Boardroom. I really must check it out. Tonight we managed something that I didn't think we'd ever do. We won a game of Elder Sign. We defeated the Black Goat of something-or-other by a cunning combination of skill, timing, luck and more luck. It was great fun. Owing to reasons of chance I was "Sister Mary", a woman with strong will, an ability to use locked dice and who is, sadly, not much good in a fight. But I was playing with a gangster and someone with second sight, so it all worked out well enough. It took us two evenings to complete the game, but it was worth the effort. 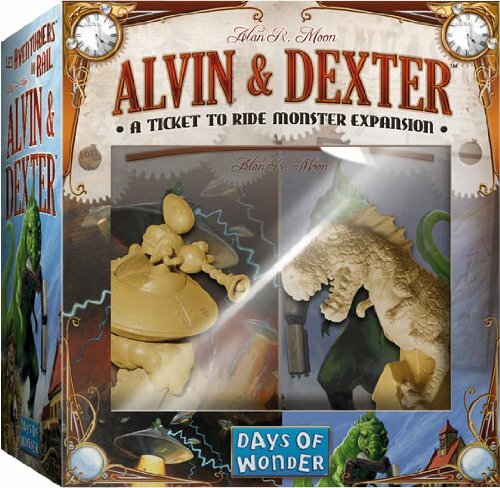 Alvin and Dexter are an add on for the wonderful Ticket to Ride board game. You can use them with any version of the game. They are a thwarty type thing you can use to stop your opponents from building train lines to particular cities. What with Winchester and Salisbury just down the road, this would seem an ideal place to have a go at Marrying Mr. Darcy. It's a card game where each player takes the role of a character in the story, all trying to find married bliss. And perhaps a fortune. You navigate events, trying to build up your character and beauty in a way most appealing to your chosen beau. And then there's a flurry of proposals and counter-proposals, after which you find out who won. You don't have to end up with Darcy to win. I ended up marrying the Colonel, and my added charm and beauty points got me onto the winners podium. The game has some nice period touches and is great fun to play. I think I could have used a few more chances to scupper my opponents though, but if you like the story I think you'll enjoy the game. Maybe I should just give up my day job and turn into a board game reviewer. Might be nice. Anyhoo, today I was given a copy of Colt Express as part of the Father's Day thing. I also got an amazing book. But that's for another day, and another blog post. The box says that each game takes around 40 minutes to play. Our first game took a bit longer than this because the first thing we had to do was assemble a little cardboard train that is the playfield. The pieces are beautifully drawn and fit together very well. And the box cleverly turns into a set of compartments so that you don't have to dismantle the pieces, you can just pop them straight in the box when you have finished playing. The game has an interesting mechanic. Each round a player builds up a sequence of moves from a random selection of cards their character gets. Some moves are open, others are secret. The good news is that if your moves go well you get to pick up the valuables in the carriages or, better yet, punch someone and pick up the loot that they drop. The bad news is that if they do the same to you first, your move sequence gets thrown out of whack and you end up punching thin air and shooting at shadows. This is our little train. Players can gather inside the train and punch each other or go onto the roof and shoot at each other. And you get free bits of cactus to help build the atmosphere. Each player has a special skill (although for the one I played it didn't seem that special to be honest) and the little train works marvellously as a fighting arena. I didn't win. But I really want to have another go to see if I can have more success next time. Adam is leaving us. End of the month. Heading to Canada. We wish him luck and thank him for all his efforts making the systems work and helping to organise lots of lovely student events. We are really going to miss him around the place. The only good thing about him leaving is that in celebration (?) we had a games evening tonight. I was quite keen to have a go at Snake Oil, as I'd not played it before, and other folks had brought along games that they thought would be fun too. Snake Oil is an OK game. Pitch ideas for dodgy products, and take it in turns to be the discerning (or not) customer. Not bad as a party ice breaker but limited, as observed by David, in that there is restricted potential for deceiving the other players. Mascarade is an awesome game, especially if you can get 13 players playing at the same time, which we did. Lots of bluff, counter bluff, and bluffing when you don't even know who you actually are. Strongly recommended if you are expecting a large number, but I'm not sure how it would go with four. I'm going to have a go though. We've played Coup before. Always fun, always infuriating. Especially when you are playing it with this bunch of reprobates. Bluffing is not encouraged, it is pretty much mandatory. The final game of the evening was Skull. Which pretty much did me in for the night. Rather like poker, but distilled down into the bluffing and deception bit. A really, really good game with the right people. And these were definitely the right people. I didn't win, but by golly I was very close. If you like dominos you'll like Qwirkle. And if you've not played much dominos I still reckon you'll enjoy it. Players take it in turns to lay down blocks and make lines of matching colours and shapes. We spent a happy hour or so playing the game today. Ticket to Ride is a track laying train game that I've always wanted to play. And tonight I got to have a go. Up to 5 people get to plan and execute rail journeys against each other. It's great fun. And you get to learn a bit of American geography as well. Hope you had a great Christmas. Ours was lovely. And we spent some time playing Camel Up, the best camel racing game I've ever played. (and I've played one or two). You get to place bets on the leader at each stage and also on the the ultimate race result. The balance is very finely wrought and leaders can switch position in the blink of an eye, so you have to be somewhat strategic in where you put your money. My opinion of the game is in no way influenced by the fact that by some inspired bets I managed to win the first time we played (I came last in the second game). Great fun for up to five players. While I was in London I bought a board game called Cash and Guns. Tonight we got to play it. The game is set in the aftermath of a successful heist. The gang is gathered to share out the loot, but it seems there is no honour amongst thieves. So everybody gets to try and stick each other up to get the richest pickings. It's a fast moving game of risk taking and score settling. Each player gets a foam gun to point at the other players and you can shout "Banzai" at crucial points in the gameplay. It is a riot. We played it with 7 players (the maximum is 8) and it worked really well. I think it would be less fun with four though.